The women of Clarksville Fox are looking for a win and a Division playoff spot Saturday, May 17, when they take on Baton Rouge Fuel at Northwest High School at 7 p.m.. The Clarksville Fox is 4-0 and is ranked 12th in the IWFL out of 43 teams. 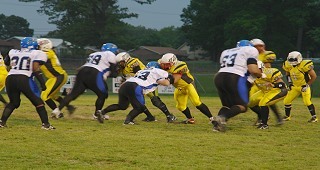 The Clarksville Fox is a Women’s Full Contact Semi-Pro Football Team. 2007 was the first year for the Fox and they enjoyed success on the field making it to their league’s Championship Game. The Fox also achieved success off the field as a women’s sports organization the community of Clarksville is proud of and supported with great crowds at the games. In 2008, the Fox joined the largest and best women’s football league, the IWFL (Independent Women’s Football League) with over 40 teams across the U.S. Playing in the IWFL will send the Fox all across the US playing the best teams in women’s football as well as bring them to Clarksville. The Fox has an exciting season underway as they play in front of huge crowds at Northwest High School in Clarksville. The team would like to invite the Clarksville and Fort Campbell community out to Northwest High School and be a part of the Fox Family. So bring your family and friends out for all the fun and excitement. For more information, visit www.theclarksvillefox.com.